The objective of the pilot action is to contribute to the monitoring and the optimization of energy refurbishment processes on the residential building stock of Piedmont region. Moreover, a target oriented long-term development of the housing stock towards NZEB is supported. A regional National Advisory Group has been involved in the activity of tracking the actual housing stock improvement and defining the energy performance targets in the short term (2020), in the mid-term (2030) and in the long term (2050). A preliminary analysis was carried out on different data sources, including database of the building energy performance certificates of Piedmont region, reports from the National Agency for New Technologies, Energy and Sustainable Economic Development, census data from the National Institute of Statistics, in order to identify the actual energy performance of the building stock, the rates of building refurbishment (e.g. Figure 1), the compliance with renovation requirements, the success of regional grant programs, the NZEB fraction of new buildings, etc. The energy performance calculations were applied to the building-types defined in the IEE-TABULA project, considering the actual renovation requirements coupled with mid and long term scenarios of energy refurbishment in Piedmont region. The actual energy performance and the planned targets were compared. Corrective actions and adequate advices to be provided to the key actors (i.e. regional policy makers, local administrations) have been identified. Figure 1. Cumulative values of the ratio of annual refurbished dwellings to the total dwellings in Piedmont region, by type of refurbished building component. Monitoring indicators and model assumptions concerning data on the building envelope and thermal system characteristics were identified for the definition of both the Basic Case, which represents the current situation of the residential building stock of Piedmont region, and the scenario analyses. As regards the model assumptions, they were chosen as to represent the most probable conditions and by adopting a reasonable compromise between the advantages and disadvantages of their application within the Basic Case and the scenarios. The calculations of the energy performance of the Basic Case and the scenarios were performed by using some representative buildings of the regional residential building stock derived from the “Building Type Matrix” of the TABULA project. The frequency of each building-type within the stock allowed to quantify the energy performance of the entire regional housing stock. The Basic Case (Figure 2) is characterized by indicators of the building envelope and indicators of the thermal system. The former are separately related to the vertical opaque enclosures and to the windows, of which eight and four U-value ranges have been defined respectively. The latter are represented by nine different heat generators, each of which is characterized by a specific energy carrier. The current state of the regional housing stock is defined by means of combinations of walls and windows U-value ranges and heating system types for each construction period. Each combination represents a percentage of the total residential building stock (RBS) floor area. - energy and environmental performance resulting from the application of the actions. Depending on the scenario, the second and the third listed properties represent alternatively the input and the output data (i.e. the result) of the analysis. The calculation of the Basic Case and the scenarios energy performance was carried out according to the procedure of the technical specification UNI/TS 11300, which is the Italian calculation method for the building energy certification and the compliance verification of minimum energy performance requirements for new and existing buildings. Figure 2. Basic Case of the Piedmont residential building stock (the percentages are referred to the RBS floor area). Figure 3. Properties of the developed scenarios. - CO2 emission factor heat supply (fCO2,heat supply). 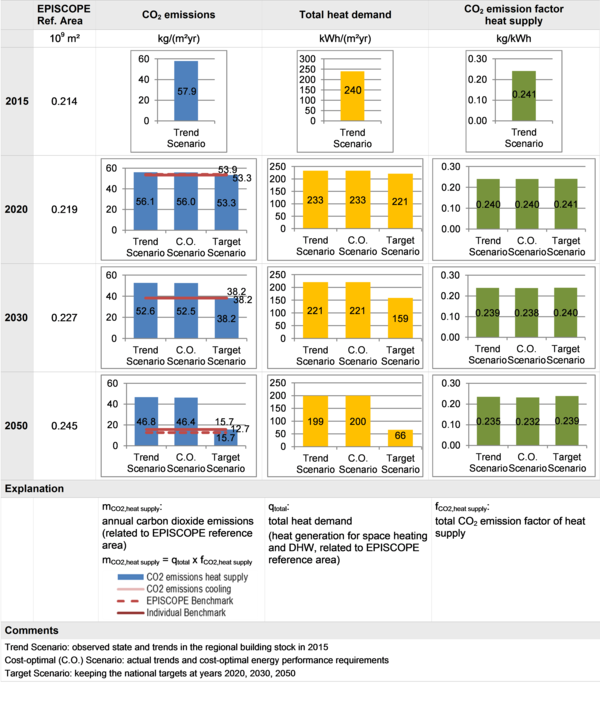 The Trend Scenario and the Cost-optimal Scenario do not reach the 2030 and 2050 targets far and they do not achieve the 2020 benchmark for a little amount. Both the Trend Scenario and the Cost-optimal Scenario follow the actual trend of energy refurbishment in Piedmont region and present similar results, even if different energy efficiency measures and requirements are applied. In fact, the Trend Scenario applies the most common measures whose requirements (e. g. U-values of the building envelope components) are fixed by a regional decree; while, the Cost-optimal Scenario considers the cost-optimal requirements for the energy efficiency measures got from the national application of the comparative methodology complying with Article 5 of Directive 2010/31/EU (EPBD recast). The sole scenario that attains the national climate protection targets in the reference years is the Target Scenario, as it has been really created at this scope in order to discover the annual trend of energy refurbishment that should be followed to reach the targets. The effective trend would consist in a global energy refurbishment of 2 % of the regional residential building stock floor area every year, although considering the same technologies and the energy efficiency requirements of the Trend Scenario. The current trend of improvements is therefore inadequate, as it is based above all on partial building renovations, and the annual global actions involving both the building envelope and the thermal systems are just 0.1 % of the housing stock floor area. Figure 4. Comparison between the results of the most relevant scenarios. 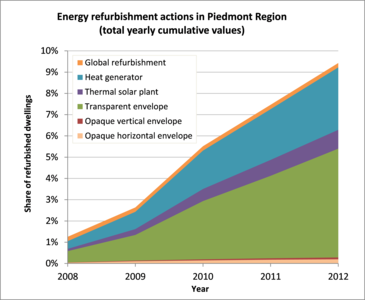 The scenario analyses on the energy refurbishment of the residential building stock of Piedmont region highlighted that if the current trend of improvements is followed, the reductions of the energy demand and the CO2 emissions are very poor. These results do not allow the climate protection targets to be reached in the reference years, although different energy efficiency measures and requirements are set for the building envelope components and the thermal systems. In order to attain more satisfying results, the retrofit actions should be rather addressed to the type of refurbishment (global and not partial renovations) and to the amount of residential floor area to be annually retrofitted, as occurs in the Target Scenario. In a precautionary way, the scenarios consider construction and system technologies commonly applied in the national and regional territory, even if the increase in the use of renewable energy sources has been reasonably supposed. Anyway, the Target Scenario already allows to attain the targets without applying highly innovative technologies. In the choice of the energy efficiency measures and the related minimum energy performance requirements, those of the Cost-optimal Scenario are preferable, because they lead to the lowest global cost in the building life cycle. However, only global renovations should be applied in order to guarantee the effectiveness of the Cost-optimal Scenario. improving the monitoring of the housing stock, by increasing the availability and the quality of data, in order to develop and update the scenario analyses and obtain more reliable results on the energy saving and CO2 reduction potentials. Piedmont Region (Department of Economic Development, Research and Innovation, Department of Environment, Soil Protection, Mining and Civil Protection). Finpiemonte Corp., regional agency supporting the development and competitiveness of the Piedmont Region territory. CSI Piemonte, consortium for the information system of the Piedmont region.